Very few people are able to run a marathon without fueling during the race. In this guide you will find the most important recommendations for designing a marathon nutrition plan. This guide was developed by MSc in Sports science, Anders Spanggaard from the VO2 Lab test centre, which is part of the Sparta Performance Centre. Anders is a running, cycling and swimming trainer and practices triathlon himself. Very few people are able to run a marathon without thorough preparation. This is true not only in relation to training, but also when it comes to intake of energy and fluids, especially before and during your marathon. That is why you need a plan on how to fuel up with energy before and during your marathon – a marathon nutrition plan. It takes practice and experience to find out which energy supplements that works for you – and your stomach – during a marathon. Start contemplating and practicing your nutrition plan as early as a couple of months before the run. It is important that you practice fueling at your actual marathon pace. There is a big difference between consuming a gel or drinking a cup of water at easy pace compared to marathon speed. 3-4 days before your marathon you should start taking in more fluids and increasing the share of carbohydrates in your diet. It’s not about taking in more calories but rather increasing the share of carbohydrates while cutting protein and fat. Rice, pasta, fruits or bread are excellent sources of carbohydrates – you don’t necessarily have to eat expensive energy supplements at this point. Guideline: 80 pct. of your pre-race energy intake should consist of carbohydrates. Make a list of foods you normally try to avoid and eat them. They are fully allowed now. Consider it a haven: You can eat toasted soft rolls with jam without a guilty conscience if that is what you like. It is equally acceptable to have soft drinks, lemonade or soda. Adding energy drinks is fine too, if it makes you increase your fluid intake. Avoid overdoing it, though. The whole purpose is to fill up your carbohydrate stores and with an increased intake of carbohydrates combined with tapering you can be sure to obtain your desired effect. Many enjoy eating pasta the day before a race and that is definitely a good idea. A vegetarian diet can also be beneficiary, not only because it is a little starchier but also because meat is digested very slowly, especially red meat. Try sneaking the extra carbohydrates into your meals without changing the basics of what you eat. If you are used to eating wholemeal you should avoid switching entirely to white bread. This runs the risk of stalling your stomach because you are not used to eating white bread. Be careful about completely replacing your meals the day before a race, for instance by switching entirely to white bread. Stick to what you usually do and add a little extra instead. Trust that your stores are sufficiently fueled the night before your race. There is no need to drain a bag of gummy bears before going to bed. This is nothing but an unnecessary stimulant that, combined with nervousness, could make it difficult for you to fall asleep. Even if difficulty sleeping before a marathon is considered normal, most people will find sleep important, at least mentally so. Tip! Some people like to a have a beer the night before a race. It helps you relax and there is no harm in it. On the day of the run it is important to have a good, carbohydrate-based breakfast, one that you know is guaranteed to work for you. The strategy is clear: Do not eat or drink anything that you have not previously had before running. Stop drinking, or take only a few sips, about an hour before race start. The water will just slosh around in your stomach and you will need to pee shortly after starting. Besides, many have the need to urinate more frequently urination due to nervousness. Tip! Oatmeal porridge is easier for your stomach to digest than plain oatmeal because it has already been broken up and mashed a bit. 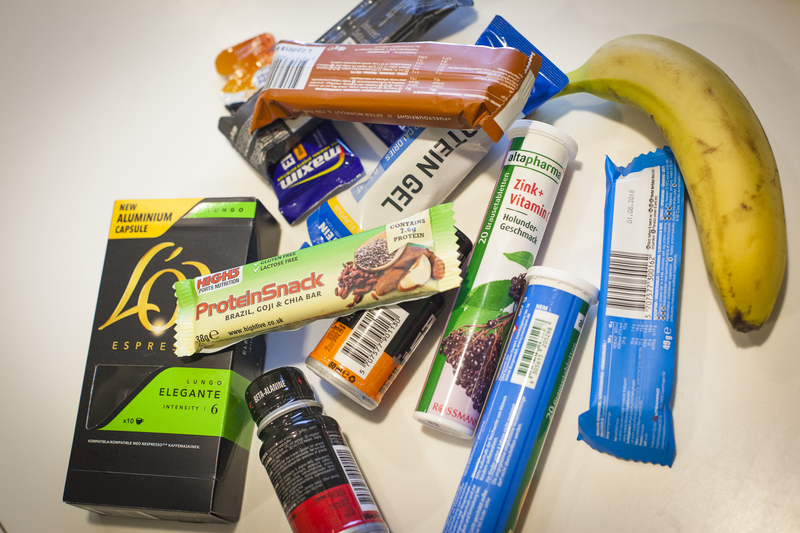 Unless you are an elite athlete you will need to take in energy during a marathon. Your carbohydrate stores will last only for 90-120 minutes of running. If you drain your carbohydrate stores completely you will hit ‘the wall’ so you need to fuel before this happens. Guideline: You can absorb a maximum of 60 grams of sugar (glucose) and 1 litre of fluids per hour – on average! This equals a maximum of 3 gels/bananas and 3-4 cups of water per hour. On warm days the body absorbs less sugar. At 20 degrees Celsius or above your body’s ability to absorb sugar decreases, so increase your fluids (up to 1 litre) and decrease your sugar. This may cause you to lack sugar but this is preferable to dehydration. Most people use energy gels during a marathon. They are easy to carry, consume and digest, and you are on top of your amount of carbohydrates. Others however either do not like gels or get an upset stomach from them and in this case bars, jelly candies, or energy drink are excellent substitutes or supplements. The goal is to find the best and easiest way for you to take in and digest the required amount of energy, and the only way to figure out what works for you is by testing and adjusting. Tip! If gels just aren’t your thing, use jelly candies, bars, and/or fruits. In general, solids take longer for your body to digest and absorb than gels, but unless you are running at a very high intensity, this might work just fine. When you have finished testing and settled on what you want to eat and drink in connection with your marathon you are well on your way to a good marathon experience. Don’t forget that you are allowed to divert from your nutrition plan. If you get a stomach ache you can easily substitute or completely switch to energy drinks or other kinds of supplements. If you are a first-timer: Focus on water and carbohydrates, and forget about salt tablets, electrolytes, creatine, and all sorts of other products. Regular energy drink contains both sugars and salts, which is most important. Keep it simple. After all, energy is not rocket science. Wise words, which can be read online, are often written by people with several marathon in the book and based on their own, personal experiences. Accept the fact that you need to make your own experiences and that you might not get it right the first time. 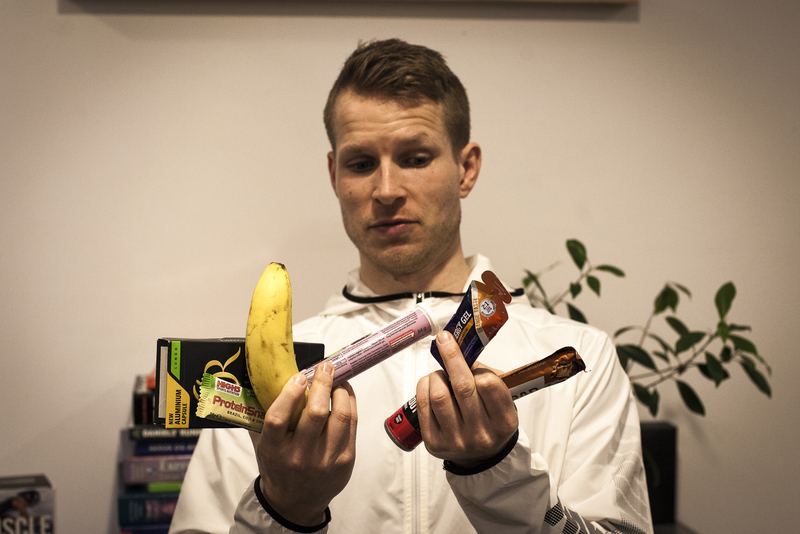 The post Marathon nutrition plan: A guide to energy intake before and during a marathon appeared first on Telenor Copenhagen Marathon 2019.